A change in NAFTA could affect Logistics and Distribution | Pedraza Freight Brokers, Inc.
By now everyone should know what NAFTA means and what it is. But just in case, here is a brief overview of the treaty agreement and the NAFTA background. NAFTA is a trade treaty that was signed by the 3 countries that occupy North America. 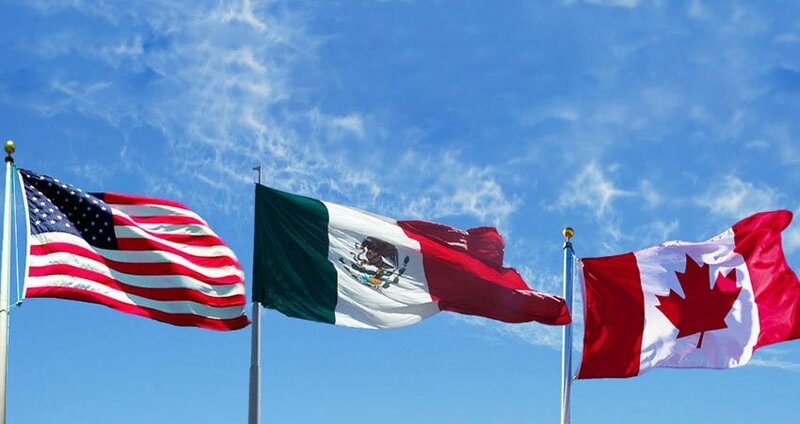 Canada, America and Mexico. The agreement was signed in 1994 and the stated purpose was to help the growing Mexican economy become a partner with the more established Canadian and American economic powerhouses. It is hard to say who has benefited most from this treaty as each country’s economies have seen significant growth in different areas. America experienced a large increase in their North American investments which has supplied the country with multi-billions of dollars of revenue. Mexico has seen a large increase in their farm exports even though they claim that about 2 million independent farms were lost. Canada has seen investment from the two countries rise over the years. So it is hard to say who has had the advantage since the NAFTA bill was instituted and signed. One thing is for sure, if there are renegotiations of the treaty, it will be even harder to determine which country will benefit the most. It is assured that each country will strive to protect their own interests and industries. This inability to determine who benefits is the result of not knowing what the changes to NAFTA will do to logistics and distribution. Moving the product from country to country will be affected in some way. No one is sure how that will apply until the changes are actually made. At best, they can only speculate and determine the worst and best case scenarios. During the last presidential campaign, it was announced by one f the political presidential candidates that the NAFTA agreement needs to be re-examined. This was dismissed as just more political talk and not given any weight. But recently, NAFTA negotiations have begun. The three countries, and most probably, America, are looking to make changes in the treaty. It is not the whole agreement that is being considered for renegotiation, just major parts. Also, new sections need to be added to cover industries that were non-existent when the original NAFTA treaty was signed by the three partners. These areas include cross-border investments, digital trade, intellectual property and environmental problems. Since these areas are new, it is vital to the NAFTA Agreement that the three countries agree on what rules should govern these issues. Plus, to have an effective free-trade treaty, they need to be addressed and included in the original agreement. But what has alarmed most industries is the renegotiation of the rules of origin section. It is said that any changes to the already strict rules will bring a nasty impact on certain industries. These are not small industries and major companies will be affected by the possible changes to this vital section of the NAFTA Bill. The automotive industry is but one. The changes in the rule of origins will affect aerospace companies, textile companies and of course, the agricultural industry. Changes in these sectors may result in higher costs to both the companies involved and the consumer. Unfortunately, only time will tell. The repercussions of any change that takes place to the NAFTA Treaty may not be seen immediately. Or, it may be that some of those repercussions will be seen by the laying off of vital members of the workforce. Everyone will have to wait for the changes to be decided upon, made and implemented before any conclusions can be drawn. One of the main industries that will be affected the most by any changes to the NAFTA Bill is agriculture. Of course, the damage down to this industry depends on what changes are made. An Anti-dumping regulation would not have an adverse effect on farmers. But it will protect those farmers in the three countries from too much supply of one product ruining their prices. Anti-dumping is not the only worry if changes are made to NAFTA. The price of shipping via rail would certainly be increased if America is successful in making changes to the NAFTA Agreement. Even if America pulls out, as President Trump has threatened, shipping costs by rail will certainly increase. Either way famers and exporters will see a rise in their costs. Before NAFTA came into existence, there was a 12% tariff applied to grain products exported into Mexico. This figure is being used as a benchmark to determine how costly the changes to NAFTA will be. If the changes result in higher import prices, then the three countries may start trading with those countries that offer the same exports at a lesser cost. Mexico has already done this in the wheat sector. Again, this scenario may not happen. It all depends on the changes that will be made as NAFTA negotiations continue. But one thing is for sure, costs will probably not go down. That is a good question. The answer is that it depends on your perspective. In the case of trade, having no tariffs or duty on your exports is a good way to produce profits. Since NAFTA went into effect n the ‘90s the trucking industry was able to benefit from the 400% increase in the new trade routes. Because so much American manufacturing has moved to other countries who provide cheap labor, changes in NAFTA will be a big deal to truck freight services. If President Trump s successful in changing NAFTA or withdrawing from the Agreement, then the ramifications will hit the trucking industry quite hard. The cost of shipping will go up to cover those extra expenses and that cost will be passed on to the consumer. This decline may result in job loss and with fewer employees earning a good wage, then there will be fewer consumers spending money. With this loss of revenue and taxes, the economy takes a bigger hit. In other words, changes in NAFTA could mean the loss of trucking, railroad, air and shipping jobs. This would be the worst-case scenario that needs to be seriously considered. Employment is the backbone of the economy and if the wrong changes to NAFTA occur, then there may be a big shift in employment. This shift will have a trickle-down effect influencing the economy of all three nations involved in NAFTA. But that is the negative perspective. It is possible that any changes to NAFTA could result in positive changes which fuel the economy to better heights. Speculating about those positive would not be appropriate and providing false expectations and hopes. Providing positive changes where all three countries could benefit will be difficult, to say the least. The question that remains after all of this is, ‘Is NAFTA worth it?’ Given the politics involved, it may not be. But there is hope because the original NAFTA Bill did provide some positive results. It also produced some negatives ones, but the positives seem to outweigh the negatives. Reduction in Costs- the lack of tariffs or penalties have produced lower prices. Lower prices mean that the consumer can buy more. Consumers buying more means that businesses make more money. Logistics & Shipping- because the removal of tariffs has made shipping economical, exporters & importers have been able to increase their product movement. This increase in product traffic means more profit and businesses need more workers. More workers mean more consumers and more tax revenue. The government and businesses win on this point. Wages Rise- This is a win for the worker and the consumer. Higher wages mean that the worker can buy more items. Buying more items means that the business has greater profits and can hire more people. A better economy- a good economy has people spending more of their money. If trade is affected, then the economy can go down and people will stop spending. If the people stop spending, then businesses lose money. If the businesses lose money…well, you get the picture. Lack of Trade- tariffs and penalties were removed not the regulations governing imports and exports. If trade is slowed, then the pros of the NAFTA Agreement have a lot harder time being realized. Loss of Mexican farms and farmers- Mexico was not developed enough to be able to compete with America on the produce front. America was far more industrialized and efficient. Mexican farmers could not compete. They lost. Cheaper Costs- Businesses are always looking to save money by lowering their costs. This is where Mexico won over it’s to counterparts. American and Canadian companies saved money by moving their operations to Mexico. This move cost jobs in both Canada and America. Environmental Issues- to compete with America, Mexico and possibly Canada had to result to using chemicals that are hard on the environment. The loss of the environment means a loss in the agricultural aspect of the economy. Do Any Changes to NAFTA Bring Benefits? The best answer to this question is- it is possible. It all depends on the changes that are accepted and implemented. One benefit would be that logistics and distribution would not be affected by those changes. In other words, if the governments can agree to leave logistics and distribution alone, their businesses would not be harmed, and they would not have to lay off workers. Another benefit could be that the American businesses would be more competitive and face less competition from those countries outside of North America. This change would help logistics and distribution keep their market share. Another benefit to logistics and distribution would be that shippers and freight haulers would enjoy far less scrutiny when they arrive at the American border. The lack of scrutiny would speed up delivery time and save on costs. It is hard to say if changes are needed to the NAFTA Agreement. One thing is certain that ever since President trump proposed the idea of changing the treaty or withdrawing from it, Logistic and Distribution companies have opposed those ideas. Why have they opposed the idea? Because they are afraid that any changes will bring a decline to their business and they will lose money. Without air, shipping, rail or even trucking freight companies, it would be impossible to get the product to the stores at a reasonable cost to the consumer. Without pleasing the consumer, any changes to NAFTA would have an adverse effect on the economy. This adverse effect would mean that logistics and distribution companies would disappear like independent Mexican farms have done since the implementation of NAFTA.